THE Department of Health’s position on the availability of cancer drugs in Northern Ireland has been questioned by a group representing the pharmaceutical industry. There are currently 38 cancer drugs available to patients elsewhere in the UK that are not readily available to seriously ill people in Northern Ireland. However in a letter to Stormont’s health committee obtained by The Detail a leading pharmaceutical group said there is already an agreement with the UK government that had the potential to give Northern Ireland greater access to cancer medicines. The Pharmaceutical Price Regulation Scheme (PPRS) is a UK wide scheme which is agreed by England, Scotland, Wales and Northern Ireland (NI). He also suggested reintroducing prescription charges of up to £25 a year could pay for a cancer drugs fund. But in the letter sent to the health committee on Saturday, a representative of the Association of the British Pharmaceutical Industry (ABPI), claimed that “despite two requests for correction”, the Minister’s comments did not explain what the group believed was the full potential of the PPRS Scheme. In the letter Colette Goldrick, Director of the Northern Ireland branch, said the agreement would cover the entire cost of growth in the UK medicines bill arising from increased use of branded medicines for the next two years. 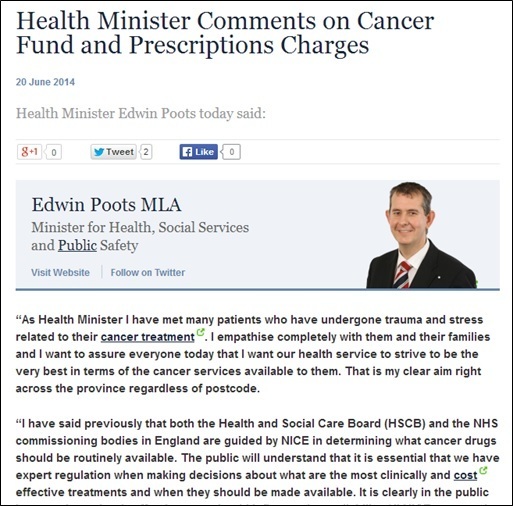 Her correspondence states: "For NI cancer patients, this means that if clinicians were empowered to increase their use of medicines available on the English Cancer Drugs Fund as they consider appropriate, there would be no additional cost to HSC until the end of 2015, and minimal additional cost until the end of 2019. However the Department of Health has responded to the letter repeating the Minister’s position that the PPRS scheme was never intended to be a vehicle to fund specialist drugs. 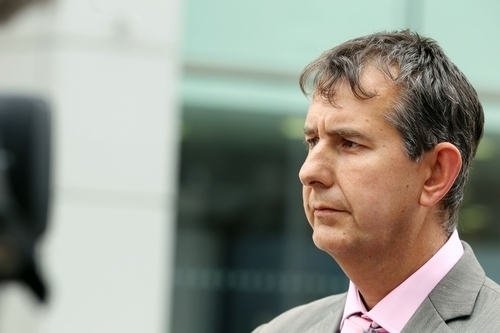 SDLP MLA and health committee member Fearghal McKinney said urgent clarification was needed from the Health Minister. Mr McKinney said the issue was becoming confused because the minister “has consistently sought to bring prescription charges and welfare reform debates into the issue of cancer drugs access”. He said the minister “must now clarify the nature of the PPRS scheme”. The latest controversy has sprung from the Minister’s comment relating to the PPRS scheme In a statement on Friday. Mr Poots said: “The Pharmaceutical Price Regulation Scheme is a UK wide scheme which is agreed by England, Scotland, Wales and Northern Ireland and has been in place for the past 50 years. The primary purpose of the scheme is to constrain the cost of medicines across the UK. It was never intended to fund specialist drugs. “Under the 2009-2013 scheme, the pharmaceutical industry could set a higher than agreed price for a medicine and then provide the difference back to government at year end. Any monies provided back to government under this scheme were therefore needed to meet any shortfall in the prescription drugs budget. • The new PPRS scheme is a “break through deal” that is entirely different from all previous pricing agreements between the pharmaceutical industry and UK government. • For NI cancer patients, this means that if “clinicians were empowered to increase their use of medicines available on the English Cancer Drugs Fund”, there would be no additional cost to Health and social Care Board until the end of 2015, and “minimal additional cost” until the end of 2019. Ms Goldrick said the minimum additional cost meant that from January 2016 until December 2019, the pharmaceutical industry would cover all but 1.8%-1.9% of increased cost to the NHS arising from increased use of branded medicines. In May this year the Health Minister announced a review of the Individual Funding Request (IFR) process which manages how patients can access cancer drugs not readily available here. Concluding her letter Ms Goldrick said the ABPI were calling on the Minister to suspend the current IFR process during the period of the review and to “take advantage of the unprecedented opportunity offered by the new PPRS".